For areas that are higher up and receive lots of moisture and rain it is important that wooden windows are maintained. 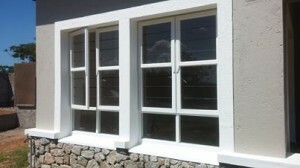 Wooden windows in White River and wooden windows in Sabie for instance, are subjected to lots of moisture in the higher up areas. Water can damage wood if the wood is not correctly sealed and maintained. Maintenance does not need to be done often but it does need to be done if you want your wooden windows to continue looking good and keeping durable. If you don’t keep your wooden windows maintained then the wood varnish will begin to peel off and make your windows look untidy. What can you do to maintain your wooden windows? Like any kind of window, dirt and pollution is going to settle on the glass and on the frame. Over time, if this is not removed, the acids in the build-up on your windows and frames will eventually eat into the varnish and destroy the wooden window frames causing the glass to fall out. You can wipe down the windows and the frames using a sponge or a cloth. Keeping the windows clean, as you would have to with any windows on any house. Water penetration: this is one of the worst things that can happen to your wooden window frame. This occurs when there is no proper maintenance done and water is allowed to settle on the wood. Wooden window frames are designed to tolerate water but when water is permanently falling onto the frame and not allowing the wooden frame to dry off, this leads to big problems for the health of your wood. Rotting wood: When you are doing your wooden window inspection and you notice that there is rotting wood, don’t despair and think that there is nothing you can do. Rotting wood does not mean that the wooden frame needs to be replaced. Although rotting wood is a worst case scenario it can be avoided by checking the wooden windows regularly as the wood will not rot overnight. When water is permanently falling onto the wood, rotting happens. In order to fix a rotting window frame you will need to remove the rotten parts and use a wood filler in the place of the rotten wood. Working order: When you are doing your checks then make sure that everything is still being held correctly in place and that the window can be easily opened and closed. Finishing: As you are inspecting your wooden windows, pay close attention to the finishing on the wood. If the finishing is not correctly maintained then you will start to see cracks in the wood. This can be avoided by properly maintaining the wood. Wooden windows in White River and wooden windows in Sabie experience high levels of moisture and as part of your homes maintenance you should keep an eye on the state of your wooden windows.